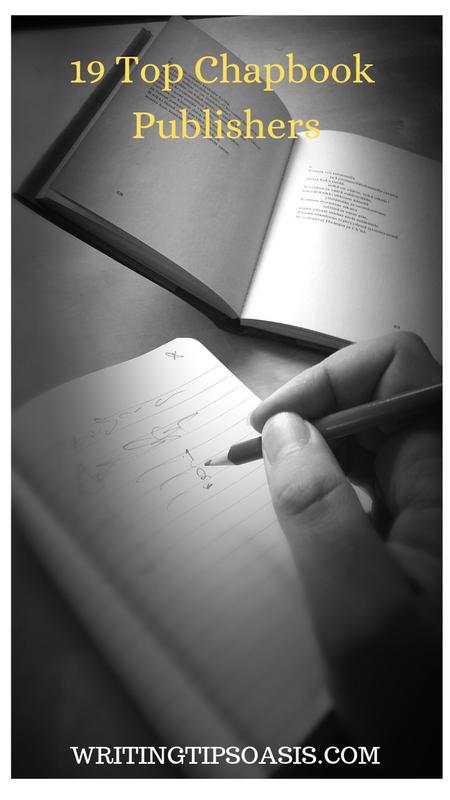 Have you written a chapbook and are now looking for publishing companies? 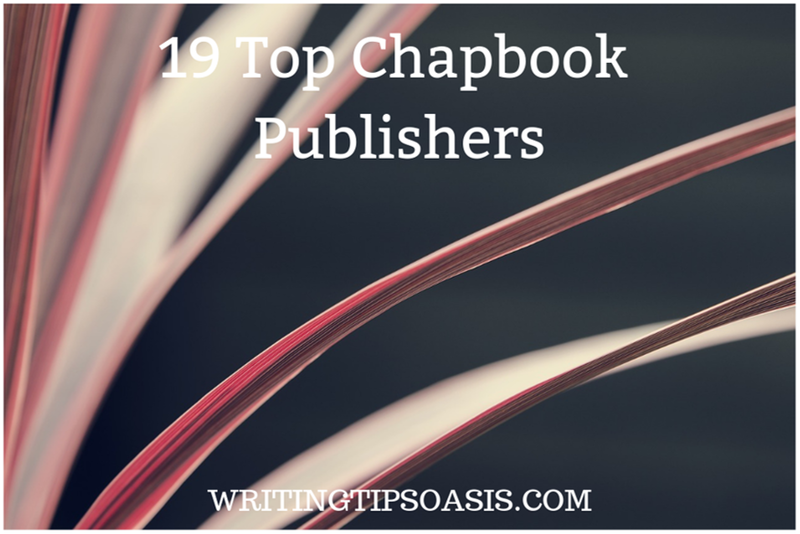 Below you’ll find a list of 19 top chapbook publishers. Projective Industries is an independent publishing press founded in 2008 that accepts unsolicited chapbook manuscript submissions every year in the month of June. Submissions can be submitted via email. They’ve published chapbooks like “Into the Forest Engine" by Garth Graeper, “Another Limit" by Linnea Ogden, and “Ecce Animot" by Mary Hickman. Based out of Washington, DC, Big Game Books is an independent poetry press that was founded by Maureen Thorson in 2006. They’ve published a number of chapbooks, and have since expanded into publishing full-length books, as well. Some of their published titles include “Articulate How" by Catherine Wagner, “Wonderous Things I Have Seen" by Brandon Brown, and “Bivalve Sonnet" by Tom Orange. Because they’re a very small press, they only publish one to two new titles annually. While they are not currently accepting submissions at this time, you’re strongly encouraged to check back later to see when this status will change. They have specific open query periods where you’re more than welcome to submit your work. They’re eager to publish work that’s original and a little out there. It’s a good idea to review their existing catalogue to make sure that your project would be a good fit before you submit. Cuneiform is a small independent publishing press based out of Austin, Texas, that was founded in 2000. They publish poetry chapbooks, artists’ books, and academic writing about humanities. Some of their chapbooks include titles like “The Books to Come" by Alan Loney, “Sudden Address" by Bill Berkson, and “Hanging Quotes’ by Alastair Johnston. They do not accept unsolicited manuscripts. However, if you’re an author with literary representation, it’s highly advised that you have your literary agent submit a query letter on your behalf. If interested in your project, a member of Cuneiform’s editorial team will reach out to you concerning how to proceed. For general inquiries or more information, you can contact the them through their website’s online contact form. Based out of Chicago, Illinois, Dancing Girl Press is an independent publishing house founded in 2004 that primarily produces chapbooks, as well as visual art books. Some of their titles include “The Patient Admits" by Avery M. Guess, “We Are Birds" by Emily Blair, and “Something Else Entirely" by Even Kenneally. Dancing Girl Press is especially interested in producing works by female poets who have unique writing voices that will engage and capture readers. They are currently closed to submissions at this time, but will reopen between June 1st to August 31st of 2019. You’re strongly encouraged to review their chapbook submission guidelines to make sure you meet all of their necessary reading requirements. All submissions must be sent via email, as no hardcopy submissions will be considered. Hooke Press is an independent publishing company that was founded by Neil Alger and Brent Cunningham in 2005. They specialize in publishing chapbook poetry collections about a wide range of topics, but are especially interested in works about the political environment. Some of their titles include “At Sea" by Melissa Benham, “Slats" by Nicole Trigg, and “Mandarin Primer" by Rosmarie Waldrop. Unfortunately, they are not accepting submissions at this time. For general inquiries or more information, you can contact the team at Hooke Press via email. Established in 2004, Horse Less Press is an independent literary publishing house based out of Providence, Rhode Island. They specialize in publishing handmade chapbooks and pamphlets, full-length books, and online journal articles. Some of their published chapbook titles include “Aluminum Necropolis" by Nichole Goff, “Blank Blank Blues’ by Anna Gurton-Wachter, and “Girl Tramp" by Cynthia Spencer. They currently do not have an open call for submissions, but it’s highly recommended that you check back later to see when this status will change. In the meantime, you can browse through their existing catalogue to determine if your chapbook would be a good fit with Horse Less Press. Founded in 1998, Kenning Editions is a small independent publishing company based out of Berkeley, California, that publishes works of poetry collections (chapbooks), and full-length trade paperbacks. Some of their titles include “Artifact of Hope" by Carla Harryman, “Double Rainbow" by Brandon Brown, and “Left Having" by Jesse Seldess. They are unfortunately not accepting submissions at this time. For more information or general inquiries, you can contact the team at Kenning Editions via their online contact form. Based out of Seattle, Washington, Letter Machine Editions is an independent publishing house that was founded in 2007 that produces books and chapbooks. Several of their titles have gone on to win awards like the LA Times Book Prize, prizes from the Poetry Society of America, and the Arab American Book Awards. Some of their most recent titles include “Sergei Kuzmich From All Sides" by Jessica Laser, “All That Beauty" by Fred Moten, and “Bijoux in the Dark" by John Yau. They currently have no open calls for submissions, but strongly urge you to check back later to see when this status changes. Since they’re a small publishing company, they only publish one to two titles per year, so the competition is very high. For general inquiries or more information, you can contact the team at Letter Machine Editions via email. Litmus Press was established in 2001 as a non-profit literary organization that publishes works from poets, writers, translators, and artists in order to promote open and mature discussion about everything from privilege to politics to feminism. They publish a wide range of chapbooks, including titles like “Well Well Reality" by Rosmarie & Keith Waldrop, “Restless Continent" by Aja Couchois Duncan, and “Towards the Primeval Lightning Field" by Will Alexander. They currently are not open to submissions, but encourage you to check back at a later date when they reopen. Fore general inquiries or more information, you can contact the team at Litmus Press via email. Based and operating out of Blacksburg, Virginia, Noemi Press is an independent literary arts organization that was founded in 2002 whose aim is to promote emerging and established authors and artists. They’ve published many chapbooks, including “The Nightyard" by Stephanie Anderson, “Lost Privilege Company or the book of listening" by the Blunt Research Group, and “Notes from the Committee" by Catherine Kasper. They are currently hosting a chapbook submissions contest and will be accepting entries until May 1st, 2019. Be sure to review their submission guidelines before proceeding. All submissions can be made on their online submissions form. They are currently on the lookout for poetry and prose. Contest winners will be announced in summer of 2019. Argos Books is a micro-publishing press that was founded in 2010. The publish works of poetry in the form of chapbooks, and are especially interested in works by women, and writers who identify as queer, trans, and nonbinary. Through their publishing efforts, they hope to expose the world of readers to new and unique perspectives about varying topics, and are especially interested in issues pertaining to ability and disability, cross-cultural communication, and overall understanding of the planet we live on. They are unfortunately not accepting submissions at this time, but you’re encouraged to check back at a later date when this status may change. While you wait, you’re encouraged to browse through their existing catalogue to see if your project would be a good fit with Argos Books. For general inquiries or more information, you can contact the team at Argos Books via email. Established in 2006, Octopus Books is a small poetry press based out of Portland, Oregon. They’ve published chapbooks like “Things That Go" by Laura Eve Engel, “Noontimes Won" by Tristan Tzara, and “Serenade" by Brooke Ellsworth. Since they’re a small press, they only publish up to four new poetry collections every year. They host an open reading period every April. If you’re interested in working with Octopus Books, you can submit your full-length poetry manuscript in April through their online submissions form. Omnidawn Publishing is a media publishing company that not only publishes chapbooks and poetry collections, but is also a video production company specializing in short films. Established in 2001, Omnidawn’s published titles have been featured in Publishers Weekly, Boston Review, American Book Review, and the Electronic Poetry Review. Some of their chapbooks include “The Man Who Lost His Head" by Zach Savich, “To Be Read in the Dark" By Maxine Chernoff, and “Sham City" by Evan Harrison. They are currently hosting poetry and fiction contests. Be sure to review their submission guidelines to learn about submission deadlines. Their current contest is open between January 1st to February 19th, 2019. They’re also hosting a poetry chapbook contest coming up between May 1st to June 17th, 2019. All submissions should be sent via email. For general inquiries or more information, you can contact the team at Omnidawn via email. Pavement Saw Press was founded in 1993, and in 1999, they began publishing four full-length poetry collections on an annual basis. They love to work with emerging talent and specialize in publishing chapbooks. Some of their most well-known chapbooks include “Wherever You Want" by Douglas Goetsch, “Their Shadows are Dark Daughters" by Naton Leslie, and “Permutations of the Gallery" by Joshua McKinney. While they are not actively seeking new submissions, you can still send a query letter to their editor via email with a chapbook proposal. If interested, a member of the Pavement Saw Press team will reach out to you with instructions on how to proceed. Phlyum Press is an independent publishing company based out of Hamden, Connecticut that specializes in chapbooks and pamphlets. They’ve published works like “language of Dog-Heads" by Cathy Eisenhower, “Amulet | Anatomy" by Roberto Tejada, and “Tulips" by Charles North and Trevor Winkfield. They are unfortunately unable to consider unsolicited manuscripts. If you’re an author with literary representation, it’s highly recommended that you have your literary agent submit a query letter or book proposal on your behalf. For general inquiries or more information, you can reach the team at Phylum Press via email. Founded in 1999 by Rachel Levitsky in New York, Belladonna* is a small publishing press whose primary goal is to publish and promote the work of women and feminist writers. They primarily publish chapbooks that focus on third-wave feminist topics. Some stories that they’ve featured in their chaplets include works like “Songbook for a Boy Inside" by Laura Buccieri, “Mirroring" by Montana Ray, and “Night Landing by Serena J. Fox. They have just finished publishing their latest chapbook series for 2018 and will reopen again for submission come Spring of 2019. You’re strongly encouraged to check back at a later date to see when they’ve reopened. For more information or general inquiries, you can contact the team at Belladonna* via email. Founded in 2006, Tarpaulin Sky Press is a literary publishing company that’s focused on publishing cross-genre/hybrid forms of poetry and prose that offer unique perspectives and interesting stories. Their published works have been featured in Publishers Weekly, Huffington Post, LA Review of Books, and NPR Books. Some of their chapbooks include “Intersex" by Aaron Apps, “[One Love Affair*]" by Jenny Boully, and “Stars of the Night Commute" by Ana Bozicevic. Their open call for submissions in 2019 is unfortunately now closed, but they strongly encourage you to subscribe to their newsletter for the latest updates and notifications about submissions. In the meantime, it’s highly recommended that you browse through their existing catalogue of titles to see if your project would be a good fit with Tarpaulin Sky Press. For general inquiries or more information about the publishing company, you can contact the editorial team via email. Based out of Brooklyn, New York, Ugly Duckling Presse is a nonprofit publisher that was founded in 2006. They publish works of poetry, translation, experimental nonfiction, performance texts, and artists’ books. Some of their newest releases include “Diary" by Liliana Ponce, “Language is a Revolver for Two" by Mario Montalbetti, and “North Was Here" by Ellie Ga. They are currently accepting submissions via regular mail. Before you send your chapbook manuscript for consideration, you should send a quick query letter via email so the editorial team can determine if your project is a good fit with the publishing company. Founded in 2009 by Deanna Baringer, BatCat Press is an independent publisher who strives to publish works by both emerging and established writers. They have an annual open reading period between June 1st to August 31st where they consider manuscripts for publication. Some of their titles include “Mole People" by Heather Cox, “When You’re Down by the River" by Christopher Lowe, and “Canyons" by Jessica Poli. They publish everything from poetry chapbooks, to nonfiction, to general fiction. They invite you to submit your manuscript during their open reading period through their online submissions form. For general inquiries, you’re encouraged to contact the team at BatCat via email. They accept manuscripts in all formats and genres, as they’re searching for something truly special and never-before experienced. Have you had work published by one of the above chapbook publishers? Please share your experiences in the comments box below!